Online Registration is now CLOSED. Call our office 971-224-5879 to find out if there are any available seats. 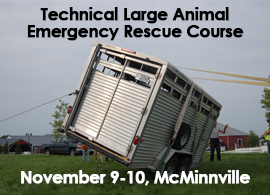 We are excited to bring world renowned expert, Dr. Rebecca Gimenez, to Oregon to instruct a Technical Large Animal Emergency Rescue course. 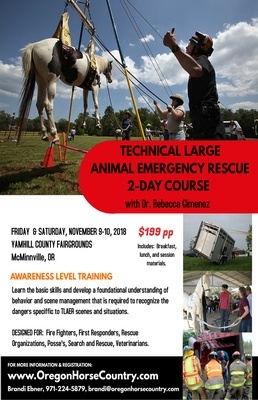 This training is open to anyone, but will be specifically geared towards fire department personnel, first responders, veterinarians, search & rescue members, animal rescue specialists, livestock breeders, horse trainers, and any large animal owner that want to be more prepared. 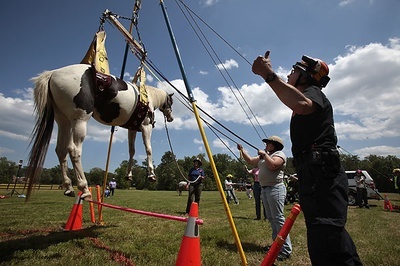 COURSE DESCRIPTION: This 2-day intense training will show you the proper was to respond and prepare for large animal emergencies, such as our northwest community needs to round out its ability to respond to a variety of emergencies. 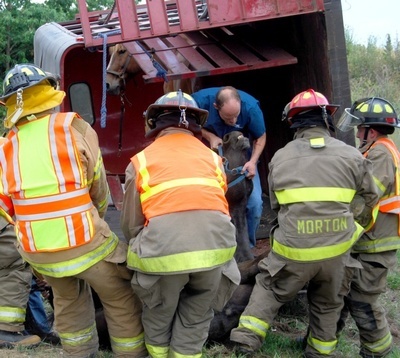 The TLAER training courses bring together people from all disciplines and introduce the latest concepts, techniques, procedures and equipment being used today – to learn to work together on a scene and build a great incident action plan, then extricate the animal safely for both the animal and responders. 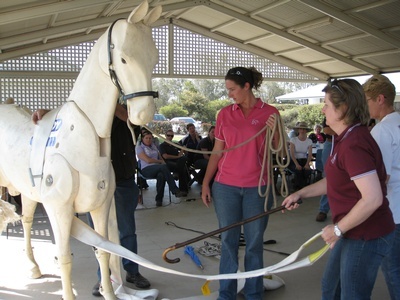 The instructors communicate and network with people all around the world to develop innovative tactics, techniques and procedures to share with their students. TLAER, Inc’s ongoing research and development focus on simple and practical applications with student-suggested improvements. Courses are updated constantly, allowing students to learn the most current methods and equipment in each course. Instructors are horse and cattle people so they know about the behavior of animals and people and how that applies on-scene. FUTURE COURSES: The is the only class being held in Oregon this year. Our goal is to bring Dr. Gimenez back annually and host her in a different parts of the state. The 2018 course will be held at the Yamhill County Fairgrounds in McMinnville, 2019 will be announced shortly for NE Oregon. We are working on a date for southern Willamette Valley/northern Southern Oregon. WHEN: Friday & Saturday, November 9-10, 2018; 8 am-5 pm (must be able to attend both full days) and includes a continental breakfast, lunch, and all materials. WHERE: Yamhill County Fairgrounds, McMinnville, OR. A portion of this course will be in an indoor arena. Please wear appropriate footwear and bring a jacket. COST: Registration is $199. DISCOUNTS: A $25 discount per person if more than 3 come from the same organization (use code DISCOUNT at checkout). Oregon Horse Country members automatically receive a $25 discount. REGISTRATION TO THIS EVENT IS NON-REFUNDABLE, BUT IS TRANSFERRABLE TO ANOTHER PERSON. All attendees must pre-register using the link on this page. Credit/debit card payment is accepted or a check may be mailed to our office: OHC, PO Box 1664, Prineville, OR 97754. Your spot will not be locked in until payment is received, so please make sure to mail checks quickly. TLAER TEXTBOOK: We have had to order textbooks already and cannot add these to the registration at this time. Participation is limited to 100 people only. CLICK HERE to register. For more information, visit: tlaer.org. Please feel free to share this event information and invite those in your community who you feel would benefit from a training of this kind. Yamhill County Fairgrounds has RV (electrical hookup available) and tent camping available. ONLINE REGISTRATION IS NOW CLOSED. CONTACT OUR OFFICE TO FIND OUT IF THERE ARE ANY AVAILABLE SEATS.